It feels like two for the price of one, and certainly it is! This amusement park offers 20 great rides, water park, beach, arcade, food, entertainment and games. Quassy is one of 11 remaining "trolley parks" in the nation and features more than two dozen rides and attractions. Huge redemption arcade, grand carousel, train ride and new roller coaster. Located on sparkling Lake Quassapaug in the rolling hills of northwestern Connecticut. It may be relatively small and offer a comparatively short ride, but Wooden Warrior is surprisingly potent and, pound for pound, is one of the best wooden coasters out there. It's also remarkably smooth, thanks to its prototype Timberliner train. Online Special: $17.00 for TWO evening ride and water wristbands. 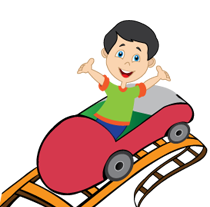 50-Cent Fabulous Fridays: Rides, hot dogs and small sodas @ 50 cents each. Click here for more discounts and promotions.